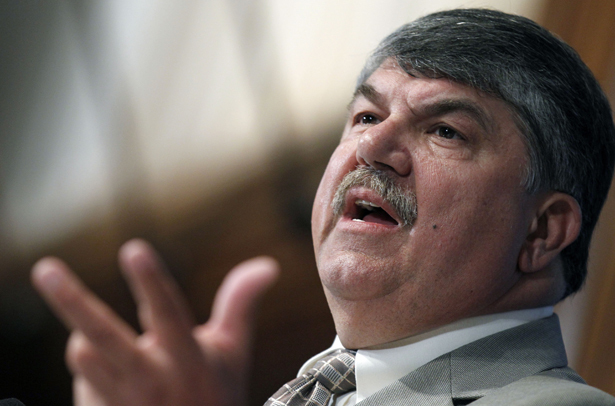 AFL-CIO President Trumka asks new labor activists for help as a strike looms. AFL-CIO President Richard Trumka addressed a gathering of labor activists in Washington this week and told them that he needed them. The sentiment was less startling than the context, at the second annual conference of the Labor Research and Action Network (LRAN). LRAN attracts organizers largely from community-based workers’ centers and training and research groups who work with low-wage, immigrant and part time, non-union workers. The biggest guy in Big Labor, in other words, a man who came up through the nation’s oldest industrial union (the United Mine Workers), was asking the newest organizers on the scene—the fast-food, retail, restaurant, day labor and domestic workers—for help. “How do we thicken relationships to both encourage experimentation and knit together a united labor movement?” he asked. It’s no wonder that he’s asking. When it comes to solidarity, Trumka knows whereof he speaks. The first time I laid eyes on him, in fact, it was in a place called Camp Solidarity in southwest Virginia. A public park turned union campground, in 1989 supporters flooded into Camp Solidarity from churches, schools and unions around the country in support of coalminers on strike against the Pittston Coal company. Solidarity sparked the strike, which came in reaction to the company’s cuts to retired miners’ healthcare and pension plans. Solidarity kept it going, through sun and snow over a long eighteen months. Squads of volunteers cooked up burgers and wings for visitors and Appalachian music kept people step-dancing late into the evening. Trumka, a former miner, then president of the UMWA, would come by to thank the camouflage-clad crowd and encourage the striking miners in their campaign of nonviolent civil disobedience in defense of the workers who’d gone before them. The UMWA occupies a particular place in American trade union history. Founded in 1890 with a (radical for its time) pledge to nondiscrimination based on race, religion or national origin, the union was a leader in the American Federation of Labor (AFL) and a driving force behind the creation of the Congress of Industrial Organizations (CIO). Under legendary president John Lewis, the UMWA didn’t organize just coalminers but the entire industrial supply chain. Lewis sent UMWA organizers out across the nation Trumka recalled this week, because he understood that coal miners’ lives were linked to those of steelworkers and autoworkers. A quarter of a century on, “We need our historic organizations of the nineteenth century to adapt to the new workforce of the twenty-first,” Trumka told LRAN. Domestic workers, day laborers, farm workers and the rest, were never targets for John Lewis’ organizers. To the contrary, in the 1930s, they were explicitly excluded from the nation’s landmark labor law, the Fair Labor Standards Act. Calling themselves the “excluded workers” today they’re organizing for basic rights like overtime, paid sick days and minimum wages through non-union structures, like the Restaurant Opportunities Center (ROC) or the National Day Laborers Organizing Network. That new generation of workforce groups has been turning heads and grabbing headlines, while traditional trade unions have been losing approximately 200,000 members a year since the 1970s. Less than half of the private sector workers—autoworkers, steelworkers, miners, plumbers—who were members in 1979 belong to a union today. “Let me be frank, I am here to tell you that the American labor movement cannot and will not continue down the same well-traveled road—but the path forward is far from clear. We need your help,” Trumka told the crowd at LRAN. He must be keenly aware of how true that is for coal miners. The UMWA just suffered its biggest blow since Pittston cancelled thousands of retirees’ health insurance cards in ’89. On May 29, a federal judge gave Patriot Coal, which declared bankruptcy last year, permission to end the existing health plan for 23,000 retirees and their families and replace it with what the union says is an inadequately funded Voluntary Employees Benefits Association or trust, administered by the union. The ruling also allowed Patriot Coal—which many believe was explicitly created to fail by the coal giants Peabody and Arch– permission to terminate the union’s current collective bargaining agreement and replace it one that reduces pay, benefits and time off for current workers. While hugely profitable coal corporations move west to non-union mines in the Rockies, or China, union miners in Appalachia are frightened of the green light the Patriot decision gives to other companies. Jim Hall, of Castlewood, Virginia, who worked for Pittston, has a lot of medical expenses after a career spent down the mines. He had to have a heart valve replaced not long ago and relies on his union health coverage. Before his retirement, Hall was active in the 1989 strike. His wife Shirley staffed the Camp Solidarity kitchen. This spring, they participated in Patriot protests and if there are more, they’ll be there, they say. They’d even support strike action. Talks between the union and the company broke off June 12. Patriot’s cutbacks could go into effect as soon as July 1. [Patriot Coal CEO Bennett Hatfield] has hinted in the past that if the union struck Patriot Coal may be forced to liquidate the company. If the company sold off its mines, the new owner would decide whether to allow the union to return to work at them. Miners and supporters rallied June 17 in St. Louis against Peabody, Arch and Patriot coal companies. Among the protesters, representatives from the Communications Workers, the SEIU and the St. Louis Central Labor Council—but there’s barely been a murmur in the national media. Will we see another Camp Solidarity? Were it to happen, it would have to look a whole lot different from the predominantly white, middle-aged crowd that gathered almost a quarter of a century ago in Virginia. More tacos, fewer hot dogs? Some salsa too, for dancing? One suspects that more than that will be wrapped up in building a more “tightly knit” solidarity for the twenty-first century. Meanwhile, one thing is clear: these are life-changing times for big, old labor.